As new technologies continue emerging, the field of computer programming continues to develop. Careers in software development and computer systems analysis are projected to grow on par with the national average, and median salaries for popular computer science occupations range from $70,000 to over $100,000. A computer programming degree allows students to turn their hobbies into a career. Avid gamers, for example, might pursue careers designing video games, and those who enjoy programming languages may become expert software developers. The IT field offers numerous opportunities for professional advancement and leadership roles, and program concentrations allow students to pursue their specific career interests. The best online computer programming degrees appear below, along with key information about obtaining such a degree. A degree in computer programming online provides you with cutting-edge skills required by the IT industry. Graduates of the best colleges for computer programming pursue licensure and certification in areas specific to computer science. They may also enter the IT workforce or pursue a graduate degree. Some programs recommend previous programming experience, but bachelor's programs do not require it. Rather, they accept students of varying experience levels, whether they come in as returning students or just graduated from high school. General education requirements equip students with a broad liberal arts foundation, and major core courses prepare them for career success in the computer science field. WHAT ARE THE ADVANTAGES TO EARNING MY BACHELOR'S IN COMPUTER PROGRAMMING ONLINE? In addition to providing the opportunity to pursue your degree from home, the best computer programming schools give you 24/7 access to course materials and IT services. Online students can easily contact their professors and peers through discussion forums and online drop boxes. Many degrees at the best online programming schools allow students to complete their courses independently, at their own pace. WGU's online computer programming degree features two tracks: one focused on Java and the other on C#. Both give students the skills and techniques required to serve as enterprise-level software developers. The program recommends the C# track for individuals who aim to work in big tech markets like Silicon Valley, New York, or Seattle. The Java track works best for students seeking to work with software for a variety of platforms beyond computers and mobile devices. WGU features competency-based learning, allowing students to set the pace of their studies by taking assessments and receiving credit for subjects they master through coursework or professional experience. When engaged in their courses, students access all materials, exams, and discussions online. Courses within this online college computer programming degree program cover topics like scripting and programming, web development, technical communication, and data management. A course in data manipulation prepares students for the Oracle Database SQL certification exam by teaching them how to create schemas, sort and restrict data, and control access to databases. Incoming students may begin the program at the start of any month throughout the year. Eligible applicants must either hold a high-level IT certification or possess an associate degree in information technology or a related discipline from an accredited institution. The program also admits individuals with three or more years of IT experience or whose transcripts reflect 3-6 credits of high-level IT coursework. While most students graduate within two years, some can finish all of the required coursework in nine months. WGU also welcomes transfer students into their online computer programming degree program. The average learner transfers 31 credits from another institution. Bellevue University's online degree in computer programming delivers extensive hands-on experience in Java, Ruby on Rails, SQL, and various web applications. Students learn how to test software and applications, manage projects, ensure information security, and conduct user needs analyses — all key skills in the ever-evolving world of information technology. The 36-credit program features courses on business telecommunications, business system programming, web scripting, and database system design and management. In an information technology project management class, students create plans to address real-world challenges, using an evidence-based approach and working on a team. Students take computer programming courses in cohorts. Each of the six sessions lasts 12 weeks. Graduates leave prepared to seek CompTIA Project+ certification. In addition to the major-focused courses, students complete 55 elective and 36 general education credits. The school is friendly to transfer students, accepting credits from virtually all regionally accredited colleges and universities nationwide. BU also waives transfer and admission fees for individuals transferring from one of the school's community college partners. To apply to this online computer programming degree, prospective students must hold an associate degree from an accredited postsecondary institution or achieve at least 60 credits of college-level coursework. The program also admits applicants with at least one year of professional computer programming experience. Applicants must submit their official high school and/or college transcripts. BU, located in eastern Nebraska, offers the same per-credit tuition rate to both resident and nonresident students. Active-duty military members and their spouses receive discounted undergraduate tuition. Fort Hays State University, located in Kansas, offers a 65-credit online BS in computer science that prepares students for careers in information system security, system center operations, capacity analysis, and hardware systems engineering. Before students can begin computer programming courses, they must pass introductory classes in computer information systems, database design, and front- and back-end web development. Major-focused courses include object-oriented programming, assembly language, operating systems, computer graphics, and software engineering. Students also complete a three-credit seminar through which they address a real-world problem, applying skills learned in the program to develop a workable solution. In a data structures and algorithm design class, students learn how to use mathematical analyses on data structures like heaps, lists, and graphs. They also come to understand algorithm design methods, including divide-and-conquer, backtracking, greedy, and dynamic programming. These concepts allow them to tackle common problems in graph theory, matrix operations, and string matching. To apply as incoming freshmen, prospective students must hold a high school diploma or GED and submit their ACT or SAT scores. Transfer students must provide official transcripts from all colleges or universities previously attended. If they have 24 or more college credits completed, their transcripts must reflect a minimum 2.0 cumulative GPA. Students may transfer up to 60 credits from another accredited institution. Including general education classes and electives, the FHSU's online computer programming degree program totals 120 credits. Most full-time students graduate within two years once they officially begin their major-focused coursework. Davenport University offers an online computer programming degree that allows students to concentrate their studies on artificial intelligence, computer architecture and algorithms, or gaming and simulation. Students develop a mastery in C#, C++, or Java programming languages. In the program's 42-credit core curriculum, students learn about computer vision, data structures, software engineering, game design, and network security. They also need to complete an internship or field experience working alongside an established IT professional. The program includes a three-credit computer science capstone through which students work with a team of their fellow learners to complete a project addressing a real-world issue. In one course, students receive an extensive introduction to artificial intelligence, learning concepts related to search techniques, decision trees, reasoning, inductive learning, and natural language understanding. They also explore current and future applications in artificial intelligence. Students then dive deep into their concentration, completing 12 credits of coursework designed to make them experts in niche areas of computer programming. DU's online college computer programming degree program also awards credit for any IT-related certifications students hold, potentially allowing them to bypass certain courses and complete the program more quickly. In addition, many of DU's computer science students minor in mathematics, which can provide a competitive edge when applying for high-paying industry jobs. A solid understanding of math concepts proves key to succeeding in the computer programming field. DU accepts credits from nearly all accredited colleges and universities nationwide. The program even awards credit for some high school computer science classes. Champlain College empowers students to earn a computer programming degree online through an efficient BS in software development. The program features accelerated seven-week terms designed to allow students to complete a bachelor's degree quickly. Students may begin the program at six different times throughout the year. The online computer programming degree program features 63 credits of professional courses, including subjects like networking fundamentals, information systems analysis, foundations of cybersecurity, and enterprise database systems. In a cloud computing security class, students learn how to protect cloud networks across a variety of platforms, while also exploring known and potential threats on a global scale. The course covers common methods of ensuring cloud security within businesses and organizations of all sizes and across industries. Before starting their major-specific coursework, students must take and pass 57 credits of general education classes on topics like mathematics, interpersonal communication, professional ethics, and economics. The program accepts students who can maintain at least a 2.5 cumulative GPA. Applicants submit 3-4 short essays, their official high school and/or college transcripts, and an up-to-date resume. Champlain also accepts up to 90 transfer credits from accredited postsecondary institutions across the United States. Students benefit from an asynchronous format, which means they can take courses largely at their own pace and in an order that suits them. All coursework takes place online, and learners may access lectures, materials, assignments, exams, and discussion boards at times convenient for them. They also benefit from academic advising, career services, technical assistance, and help with financial aid and scholarships. Located in Wichita, Kansas, Southwestern College offers an online computer programming degree that prepares students to serve as effective computer systems analysts, web developers, database administrators, and business intelligence analysts. By the time they graduate, students know how to write a variety of programs for the web, execute business programming solutions, apply VBA programming methods, and develop computer program documentation. Core courses within this online college computer programming degree include Java programming principles, project design, Microsoft Access, and HTML programming. One course focuses on using VBA to develop secure code that automates a variety of Microsoft Office tasks. Toward the end of the program, students complete a capstone in which they work on two projects that demonstrate the skills and knowledge they gained from their prior studies. All Southwestern College distance learners enjoy access to a full suite of student services, including an online writing center, a digital library, career resources, and academic success representatives. The school also charges the same tuition for resident and nonresident students, with qualifying military members and their families benefiting from a special low tuition rate. Eligible applicants must complete at least six college credits after high school while maintaining a minimum 2.0 cumulative GPA. To graduate from the program, students must maintain a minimum 2.0 GPA and complete 124 total credit hours, with at least 30 of those credits taken at Southwestern College. The school is accredited by the Higher Learning Commission of the North Central Association. The Hodges University Fisher School of Technology delivers an online bachelor's degree in computer information technology with concentrations in software development and cybersecurity and networking. Each track totals 120 credits, including general education, major-specific, and elective classes. Individuals pursuing the software development concentration take classes on Java programming, systems analysis, mobile application development, software engineering, and enterprise applications. Students in the cybersecurity and networking track explore topics like information security, project management, routing and switching, computer forensics, and incident response. They also conduct penetration testing to determine whether a computer or network has been compromised. In both concentrations, students take classes in a predetermined sequence that allows them to graduate in 10 sessions — just under four years. The 120 total credits include 36 general education, 78 computer science, and six business credits. By the time they graduate, students can seek certifications in A+, Cisco certified network associate, Cisco certified entry networking technician, Linux+, Network+, and Security+. To apply to one of these online computer programming degree programs, prospective students fill out an online application and participate in an in-person or virtual meeting with an admissions counselor who may ask for additional documentation regarding the applicant's academic history and program of interest. Hodges University's campus resides in Naples, a community just south of Fort Myers in southwest Florida. Students may choose to take classes online or on campus. Limestone College delivers an online BS in computer science with a programming emphasis. The program enables students to solve various programming challenges so that they can thrive in their careers, focusing largely on computer and network architecture, cybersecurity, and systems administration. Students in this 123-credit online degree take courses on advanced microcomputer applications; operating system fundamentals; project management; C#; and visual, imperative, and object-oriented programming. Toward the end of the program, students compete a three-credit capstone, applying what they learned through their previous coursework to a unique project. The course involves delivering weekly status reports, writing one or more research papers, and taking a final exam. All online classes feature eight-week terms, with six terms throughout the year. Most classes do not include scheduled meeting times. Learners can access materials, assignments, discussions, and exams largely at their convenience. They may also take evening, in-person classes at the school's campus in Gaffney, South Carolina. For admission, applicants must hold a high school diploma or GED and submit official high school and/or college transcripts. Individuals under 21 years old and not part of the military must also provide their ACT or SAT scores. Designated as a VIQTORY Military-Friendly School, Limestone delivers flexible programs and special tuition discounts for service members and their families. Students enjoy access to academic advising, writing assistance, library resources, career services, and financial aid and scholarships. 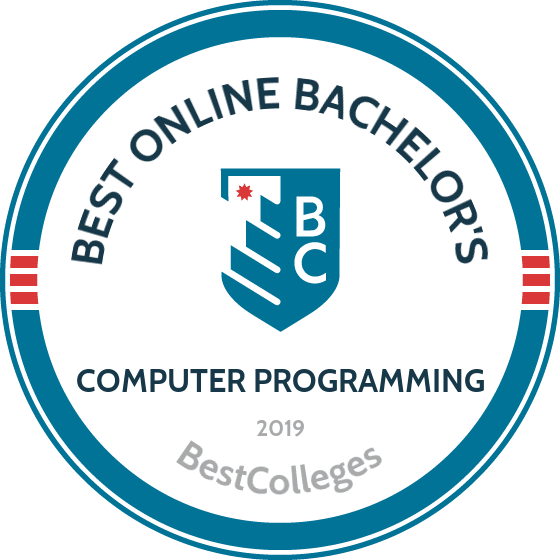 By seeking an online computer programming degree, Baker College students engage in coursework and experiences that prepare them for the constantly evolving worlds of software engineering, application development, cybersecurity, and network administration. The 120-credit program, available online or on campus, features 71 credit hours of major-focused coursework, along with general education classes and electives. Core courses include subjects like Visual BASIC, database management, Java and C# programming, big-data analytics, and programming for mobile devices. A class on artificial intelligence explores how computers can act intelligently through search, knowledge representation, and logic. The course also examines past, current, and future trends in AI performance. Students must take 18 credits of programming-specific classes, including computer architecture, systems development, report builder analytics, and Python programming. Additionally, they must complete 300 hours of a real-world learning experience through a computer science-related internship or job. Worth six total credits over 20 weeks, these experiences include a supervisor evaluation that determines the student's grade. Eligible applicants must hold a high school diploma or GED and submit their official transcripts. The college does not ask for ACT or SAT scores as part of the admission process. Enrolled distance learners may access resources like academic advising, career services, tech help, a writing center, and tutoring. Baker College, located in Flint, Michigan, is regionally accredited by the Higher Learning Commission. The school charges the same tuition for in-state and nonresident students, while offering special discounts for active military members, National Guard and Reserve members, and individuals involved in the GoArmyEd program. The best online computer programming programs prepare students for a variety of careers in the field of computer science, often allowing them to specialize their degrees. Details may vary depending on the school and program. Individuals hoping to enroll in one of the best computer programming schools must meet a number of academic requirements. Applicants pursuing a bachelor's in computer programming must possess either a high school diploma or GED. Most schools also set minimum GPA requirements for previous coursework, often mandating GPAs of 2.5 or higher. The best online programming schools also request standardized test scores from either the ACT or SAT, and most pay particular attention to scores related to science, math, and reasoning. Bachelor's programs do not typically mandate prior professional experience, since many undergraduate students come directly from high school. Advanced degrees, however, may require relevant work experience. Courses may vary depending on program requirements, but most online bachelor's degrees in computer programming include the following courses in their core curriculum. Computer Architecture: This course examines the structures of computer systems by familiarizing students with trends in computer architecture. Students gain skills in performance measurement, memory hierarchies, computer arithmetic, and data path design and control. Students also learn how to write assembly language code. These skills prepare students for careers as software engineers and systems administrators. Computer Graphics: Students learn 2D and 3D concepts and algorithms used in shader-based programming. Course topics include animation, material simulation, and interactive user interfaces. The course familiarizes students with software architecture used to implement coloring effects and textures. These skills allow students to pursue careers in computer graphic design, web development, and animation. Programming Languages: This course introduces students to programming languages and equips them with skills to write secure computer programs. Coursework familiarizes students with the syntax and semantics of programming languages, and students learn how to design programs using imperative, functional, and declarative languages. Computer programmers, computer science modelers, and software developers use these skills. Data Science Students in this concentration gain knowledge of the data models, methods, and tools used in data analysis. Data science students acquire skills in programming languages, computer architecture, and mobile computing. Concentration courses range from data warehousing to streaming data analytics. Data scientists, scientific researchers. HOW LONG DOES IT TAKE TO GET AN ONLINE BACHELOR'S IN COMPUTER PROGRAMMING? Most online bachelor's in computer programming programs comprise 120 credits, which full-time students can complete in four years. Typical program curricula include both general education coursework and major requirements. Factors influencing program length may include whether students enroll full time or part time, how many credits the degree requires, and whether the program implements internship or capstone project requirements. Most programs accept transfer credits, which may shorten program length. Students earn their online bachelor's in computer programming either at an individual pace or as part of a cohort. Both learning formats promote supportive online learning environments. Individually paced programs often admit students throughout the year, and these learners pursue their degrees at their convenience. The cohort-learning model admits students at the beginning of select terms, such as fall or spring, and these students form a supportive learning community that follows a cohesive study plan. Each program offers a unique skill set to its students, and these skills may vary depending on each student's chosen courses and specialization. However, most computer programming degrees entail at least a few common skills to propel students into the computer science field. For more precise information, speak with department representatives from your prospective school. Attention to Detail: Coding is a laborious, tedious process, requiring intense, sustained focus. Computer programming students learn the value of paying attention to details early in the coding process, thus avoiding major mistakes later on. Patience: Programming typically requires many long hours of work. Students learn to practice patience and focus when programming. Communication: Computer programmers often work with designers, marketers, and other administrative staff to understand their vision and create the program, app, or other deliverable accordingly. Communication plays a key role in this process. Flexibility: You and your client may start out with a specific vision for your final product, but this vision is likely to evolve and change over time. The best programmers know how to roll with changes, using their creativity to produce a satisfactory product. Professional Engineer Licensure: Computer and software engineering students may choose to pursue PE licensure. Recent graduates complete four steps: The Fundamentals of Engineering Exam, four years of supervised engineering work, state licensure requirements, and The Principles of Engineering Exam. PE licensure can work to advance your engineering career. Computer Programming Languages Certification: Students interested in working as computer programmers, software developers, or database managers can boost their programming expertise through additional courses offered by accredited certification programs. These courses teach programming in popular software platforms, including Java, Visual Basic, and Microsoft Access. Before enrolling in a certification program, contact your state's licensing board to see about additional requirements. The best online computer programming degrees come from accredited universities, which participate in peer review processes to ensure academic accountability. Universities can obtain either regional or national accreditation, both of which exist across the country. Public nonprofit universities usually hold regional accreditation, while private, for-profit universities -- along with vocational and distance learning programs -- often seek national accreditation. Credits from regionally accredited universities tend to transfer more easily, and some regionally accredited schools only accept credits from other regionally accredited institutions. The Distance Education Accrediting Commission (DEAC) is an accrediting body that specializes in distance learning. It sets standards and policies that online programs accredited by the DEAC follow. Program-specific accrediting bodies, such as the Accreditation Board for Engineering (ABET), ensure that programs adhere to the standards of their profession. ABET accredits applied science, computing, and engineering programs, and its educational standards are developed by technical professionals. Accreditation organizations are overseen by the Department of Education (ED) or the Council for Higher Education Accreditation (CHEA), both of which promote student success by setting education standards. This standardization process requires accrediting bodies to participate in ongoing self studies and peer reviews. You can review a program's accreditation through the extensive databases available on either the CHEA website and the ED website, which include all accredited schools in the country. An online bachelor's in computer programming prepares students to choose from a variety of career paths in the information technology (IT) field. Each occupation imposes a unique set of tasks, but all require strong analytical, communication, and organizational skills. Computer network architects and software developers rely on creativity to meet organizations' networking and software needs. They often work 40 hours or more each week and must travel frequently to complete projects. Computer network architects develop data communication networks ranging from small in-office connections to cloud infrastructure. They rely heavily on the organization's business plan to design appropriate networks. Other job tasks include researching emerging network technologies, upgrading hardware, and implementing security patches. Computer systems analysts work with organizations to evaluate their current IT systems and develop new, more efficient ones. They research new technologies, install new systems, and train system users. Systems analysts often specialize in computer systems specific to their organization, such as financial computer systems. Database administrators (DBAs) secure organizational data, create administrator databases, and restore data to prevent loss. They ensure optimal system performance and accessibility for data analysts. DBAs conduct general tasks, such as assessing the data needs of a company. Software developers design software to meet user needs. They recommend software updates and provide maintenance for existing programs. These developers design every component of a system and create diagrams for programmers to follow when writing software codes. They often work with other computer specialists to supervise software development projects. Web developers work both in-house for individual companies and in freelance capacities to design and build websites. They collaborate with their employers to understand the needs and aesthetic desires for the prospective site. They then write code, integrate graphics and media, and commission content to fill each page. Graduates from computer programming degree colleges can expect vastly different earning potentials, depending on their chosen careers. Computer network architects enjoy the highest starting income and pay throughout their careers, while web developers and computer system analysts earn the smallest salaries. Professionals looking for the highest wage increase over time may consider software developer roles. Computer programming graduates should consider their prospective industry and location, as well, both of which may significantly influence income. Joining a professional organization provides you with opportunities for career and academic advancement. Members gain access to valuable resources, including professional networks, job postings, and the latest in IT research. Many professional organizations offer continuing education programs, including conferences, webinars, and online certification training. Members may access scholarly publications and digital libraries, and student members benefit from scholarship opportunities, career advice, resume writing, and job and internship alerts. Students who become members of professional organizations learn how to advocate for the IT industry and become familiar with policies impacting the profession. IEEE Computer Society: With more than 60,000 members globally, the IEEE Computer Society publishes 17 scholarly journals and 13 magazines focusing on the latest trends in technology. Its members enjoy access to training and development programs, conferences, and webinars. Association for Computing Machinery (ACM): ACM provides numerous networking opportunities for students and professionals, including 37 special interest groups in the areas of artificial intelligence and hardware design. Computing Research Association (CRA): CRA offers a variety of professional resources, including workforce reports, best practice memos, and scholarly publications. It hosts a biennial career mentoring workshop for IT professionals interested in higher education careers. CompTIA: CompTIA, an association for IT professionals and students, offers insight and tools in the areas of IT research, mobility, security, and finance. Student members benefit from webinars and training events, including cloud computing and data recovery. Computer programming students may choose from several financial aid options, starting with assistance from the federal government. Students should complete the Free Application for Federal Student Aid (FAFSA) to determine their loan eligibility. Online bachelor's in computer programming programs often provide students with alternatives to paying for their education out of pocket. Program-specific financial aid may include scholarships for enrollment in the upcoming term, military and public service discounts, and interest-free monthly payment plans. Professional organizations also offer scholarships for computer science students. Approximately 66% of today's college students rely on loans to fund their education, but plenty of overlooked financing options are available to reduce students' financial burdens. Completing the FAFSA marks a crucial first step for any student with financial needs. Our FAFSA guide features a step-by-step rundown of the process, plus answers to several frequently asked questions. Financial aid for online learning is equivalent to what you can find for campus-based learning. Learn about the different funding opportunities available to online students. Online college programs create a flexible, affordable alternative for single parents interested in earning their degree and securing their family's financial future. We've compiled a list of scholarships, grants, and other financial aid options geared toward single moms and dads.